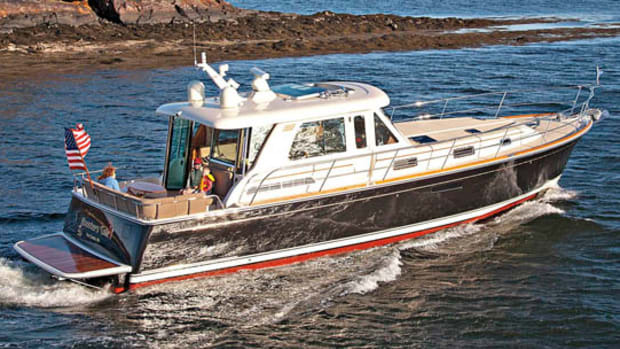 This Maine-built Cruiser employs IPS to offer duck-and-slip maneuverability and straightaway performance. The plethora of lobster-pot buoys that dotted the waters outside Dimillo’s Yacht Sales in Portland, Maine, looked simply unavoidable to this New Yorker. Heck, I could run a tanker between the pots I see in an average trip down here. But that’s not the case in the Pine Tree State. 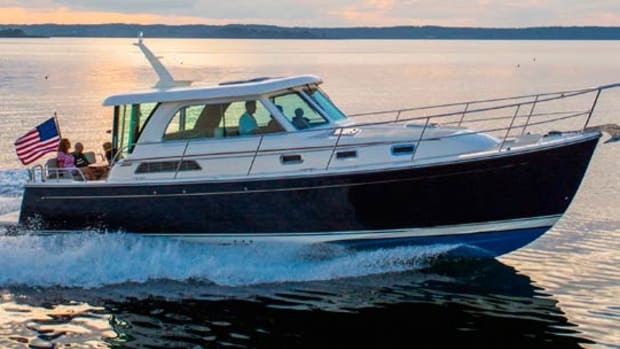 Tight maneuvers are the boating way of life here, and with that thought in mind I was happy that my Sabre 52 Salon Express test boat was equipped with optional twin 700-hp Volvo Penta IPS900 diesels jackshafted to its forward-facing pod drives. 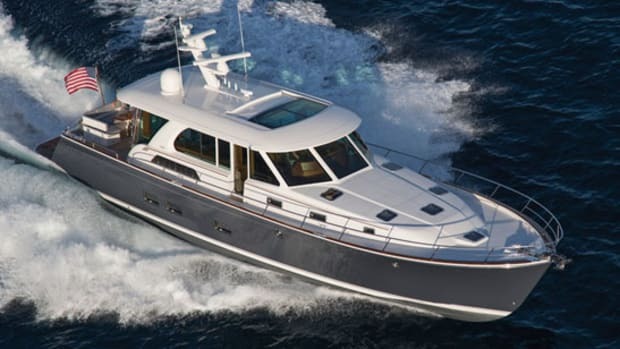 They let me spin the 53-footer within her length, slide her sideways to steer clear of buoys, and more. This vessel is the first pod-drive boat from Sabre, and she exists thanks to her owner, says Bentley Collins, vice president of marketing and sales. 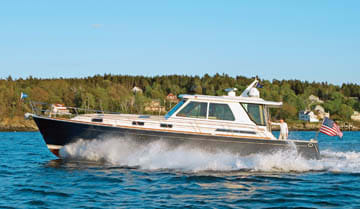 Sabre had sold about 16 conventional straight-shaft, Caterpillar-powered 52s before this owner requested a pod-drive boat. After some conversations with him (and lots of calculations), Sabre decided it could not only build a boat that was more maneuverable, more efficient, and faster than her straight-shaft sister ships, but one that was quite a bit lighter to boot. To reach the 52’s final weight, Collins says the whole boat had to be reevaluated. Some of the weight savings came from going to a mostly 24-volt system, which saved about 3,500 feet of wire. The designers also decided to go with one 9-kW Onan diesel genset as standard instead of two. 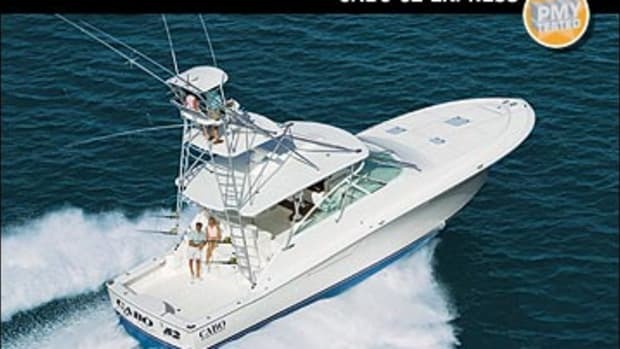 In the Cat-powered sistership, the second one was installed so that all genset-dependent systems could be run if one went down, Collins says, noting that Sabre determined that the IPS-outfitted boat could effectively operate its systems with just a single genset. Reducing fuel tank capacity from 800 to 700 gallons saved more weight. (This one wound up being a wash as the owner decided to keep the 800 gallons for extended range.) The builder also went with a 120-gallon freshwater tank instead of 200; to make up the difference our test boat was equipped with an optional 300-gpd Spectra Newport MKII watermaker. All told, about 7,500 pounds came out of the boat—this in spite of the fact about 2,000 extra pounds of fiberglass went into her hull to reinforce the area around the pod drives. What did all of these changes mean when the 52 with IPS launched? In a word, performance. 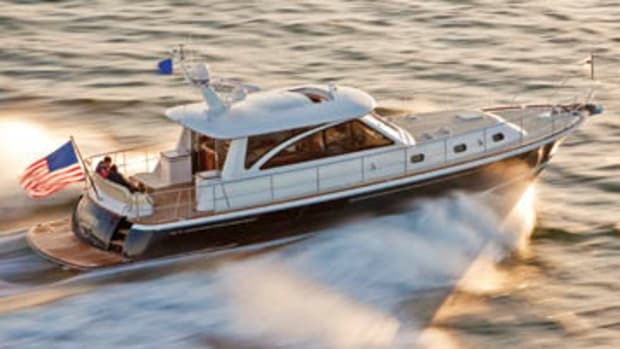 With her modified-V hull form with 23 degrees of deadrise amidships and 15 degrees at the transom, my test boat made an effortless 2000-rpm cruise of 29 mph at a cost of 43 gph. This works out to 0.67 mpg and a range of 485 miles with a ten-percent reserve. Throttled back to 2250 rpm, the 52 hit 34.5 mph while burning 54 gph for 0.64 mpg and a 459-mile range. That said, I noted that at WOT the engines in my test boat were turning 2410 rpm. Since the motors are rated at 2350 rpm, I think it’s possible that this boat could see even better efficiency with some minor prop tweaking. 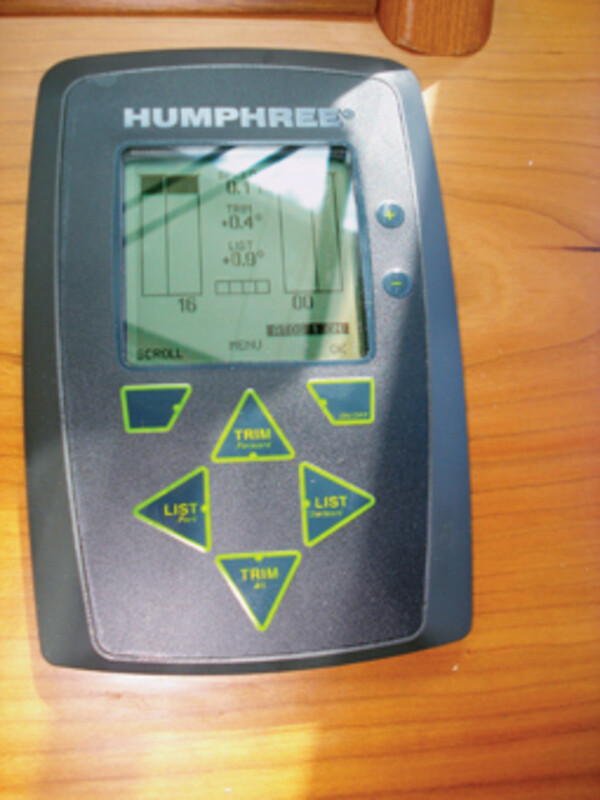 One thing that doesn’t need adjustment is the 52’s Humphree trim system, as the running angles I measured never exceeded 4.5 degrees. Collins told me that when Sabre started working with IPS it used the Volvo Penta QL trim tab system, which acts like a fence moving vertically to adjust a boat’s attitude. But with it the 52’s running angles were nearing the 8-degree mark, so Sabre’s engineers decided to try the more robust system from Humphree (see Noteworthy, this story) to bring down the bow. As you can see from our specs, the system did just that. Running bow up or bow down, this yacht’s interior finish and layout was eye-catching. Just a few steps up from the all-white cockpit you enter the saloon, which is adorned in a satin-finish cherry. Wide side windows bathe the space in light, but the coolest feature here is the curved glass that wraps around the aft section of the saloon. (To make the bend, the glass is heated and wrapped over a wooden form.) When you combine the openness created by all that glass with 6&apos;8" headroom and three windows forward that span the width of the house, you get 360-degree visibility. This is a great place to relax and watch the world go by while cruising. And with the helm station just forward and to starboard of the saloon, no one’s ever too far from the skipper, who will surely be happy in the standard Stidd captain’s chair. (Two Stidds are standard but the owner of my boat opted for one to gain some floor space.) If the helmsman has to leave to check on the standard Lewmar windlass or any one of the aluminum hatches on the rounded trunk cabin, he can do so via the formidable and standard pantograph-style starboard-side door. Equally beefy are the oversize (1 1/2") stainless steel handrails and siderails. The hip-height rails also flare out at the top as you move forward offering plenty of maneuverability. The side decks are just as accommodating and wider than both of my size 10EE boat shoes sitting side-by-side. Space also abounds in the below-decks area where a galley and two staterooms can easily accommodate a cruising family for extended periods. Sliding pocket doors for each room—the master’s feature shoji screens—maximize useable space and create an open feeling, as does the light raining down from those helm windows. Several overhead hatches help, too. Though the 52’s living accommodations are more than adequate for overnighting or extended cruising for a couple or family, it was the openness of the engine room of this boat that impressed me. With the straight-shaft Cats there is about six inches of space between the top of the motors and the overhead, which is insulated with about four inches of sound-deadening foam. The Volvos, however, have a lower profile, thus increasing the space above the motors to 20 inches, which makes working on the tops of them a breeze. There’s also 30 inches between the motors, and the rest of the ER is equally accessible. Dual Racors are mounted on the aft bulkhead, and the watermaker is forward of the port motor and easily reached. The standard Reverso oil-exchange system is conveniently situated under the steps that lead up to the cockpit, and the electrical panel is on the forward bulkhead for quick access. 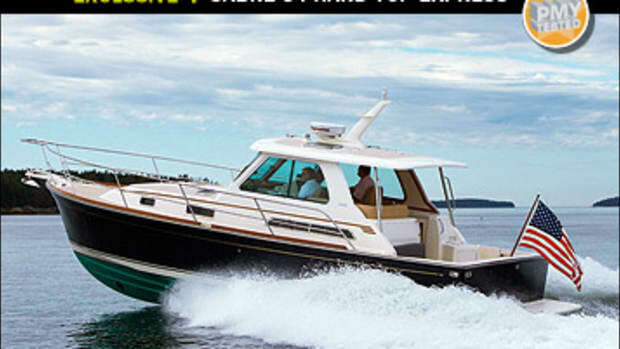 Simply put, the Sabre 52 Salon Express with IPS is a complete boat. I did find a few odd things however, such as the IPS joystick mounted under the gunwale towards centerline next to the transom door (right at a-kid-can-grab-it height) and the removal of the trademark teak trim along the vessel’s exterior, both done at the direction of the owner. At the owner’s request, this joystick was also equipped with extra wiring so he could remove it and dock the boat from the cockpit, and the wood was taken out to reduce maintenance. But then again, that’s one of the things that makes this Maine-based builder so popular among Downeast aficionados. 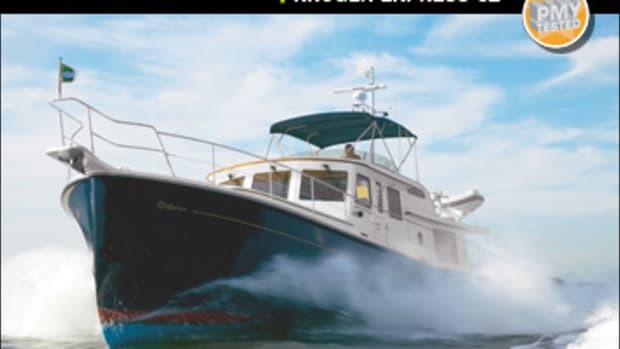 It builds a timeless-looking boat with modern accoutrements and is willing to let an owner put his stamp on her. 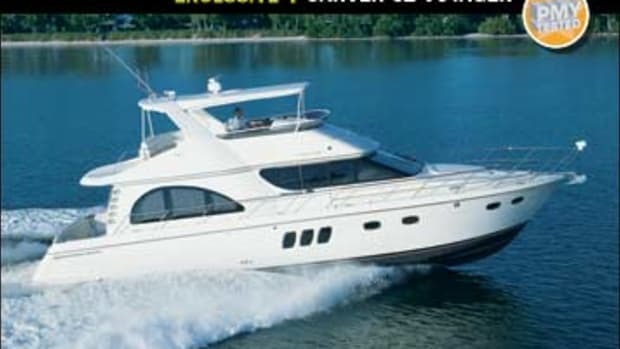 If this sounds like a vessel for you, Portland is a great place to sea trial your Sabre. And don’t worry about the lobster-pot buoys. If you’ve ordered IPS, you can just slide her sideways. Sabre Yachts (207) 655-3831. www.powerandmotoryacht.com/sabre-yachts. I’m 5&apos;7", and I sometimes have a hard time seeing over the foredecks of express-style boats coming onto plane. So I often depend on trim tabs to get a vessel’s bow down. 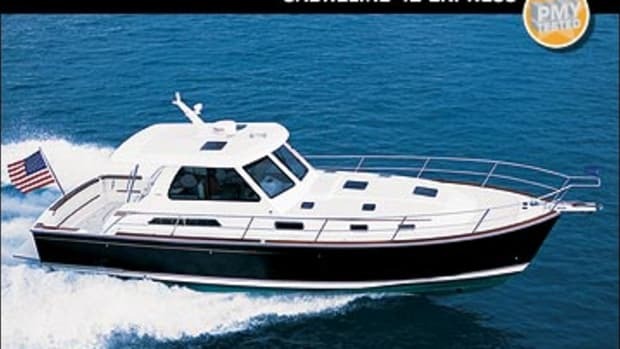 Happily, seeing over the foredeck wasn’t a problem for me on the Sabre 52 because she was equipped with large and beefy composite trim tabs that adjusted via switches at the helm controlling a servo motor located in the middle of each tab. These Humphree Interceptors had been installed after Sabre found that the Volvo Penta QL tabs weren’t getting the bow down quite low enough. You can see in the specs here that the test boat’s bow never rose above 4.5 degrees, thanks to the Interceptors. In addition, these tabs featured an optional auto-trim control, which allow the software to adjust the trim without input from the helmsman. —P.S. This article originally appeared in the September 2010 issue of Power & Motoryacht magazine.